The Woodinville Chamber was pleased to honor our January 2019 Student of the Month, sponsored by Pacific Northwest Law Group. This month’s featured student was Xinan (Nancy) Wang, a Senior at Woodinville Montessori School (WMS). 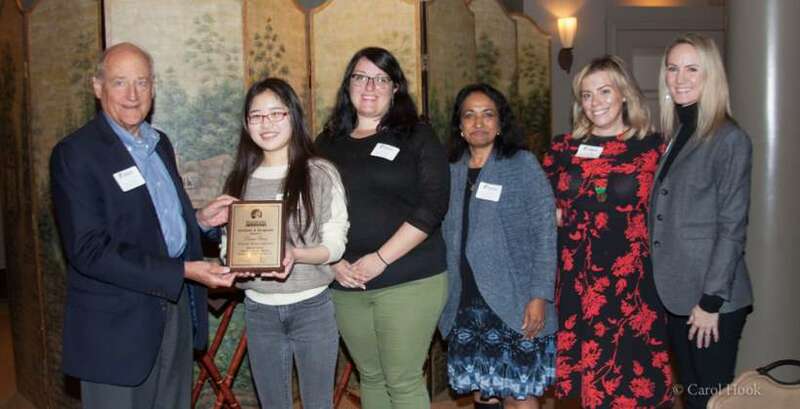 Pictured here: Bob Sailor, Pacific NW Law Group (Student of the Month Sponsor), Nancy Wang (January 2019 Student of the Month) Lyla Irvine (Advisor, WMS), Sunita Pailoor (Head of School, WMS), Keri Sliger (Director of Development, WMS), Kimberly Ellertson (Director of Marketing, Woodinville Chamber). Photo courtesy of Photography by Carol Hook. Plaque courtesy of Northwest Trophy & Award, Inc.